Directional T-interchanges lie east of the Poplar Street Bridge, joining Interstates 55 & 64 with Illinois 3 from Sauget to the south and a freeway stub (unconstructed U.S. 460) into East St. Louis. Photo taken June 1, 2011. Interstate 55 vastly replaced the routing of U.S. 66 northeast from St. Louis to Springfield, Bloomington-Normal, and Wilmington while en route to Chicago. The freeway directly overlaid many portions of four-lane U.S. 66, with sections of the route relegated to frontage roads or as business loops through cities bypassed by the freeway. Within Chicago, Interstate 55 follows the Stephenson Expressway to a northern terminus at U.S. 41 (Lake Shore Drive) off of Lake Michigan. Toronto Road intersects 6th Street Frontage Road immediately east of the diamond interchange with Interstate 55 in Springfield. The frontage road system of I-55 more or less acts as Historic U.S. 66 to Lake Springfield. Photo taken 12/20/09. Westbound Toronto Road at 6th Street Frontage Road. Historic U.S. 66 replaced the adjacent Interstate 55, but had its own frontage road system before the freeway upgrade. An older alignment of U.S. 66 leads to the east via Cotton Hill Road north to Southwind Road. Photo taken 12/20/09. 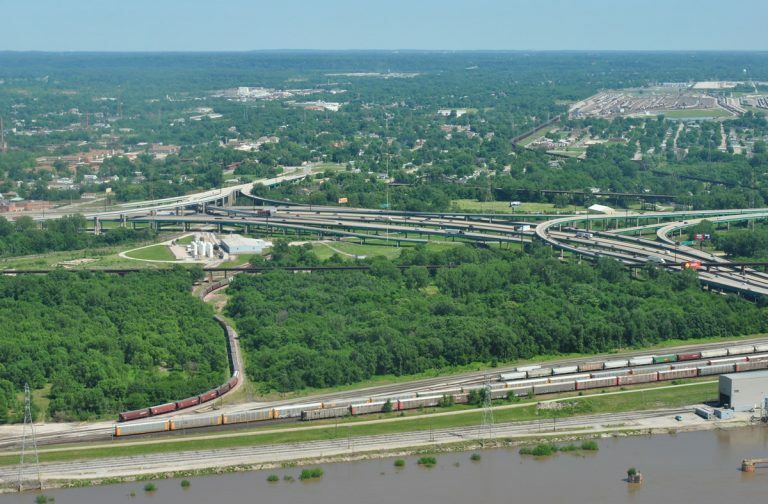 Drivers bound for Downtown Springfield join Interstate 55 north ahead of Interstate 72 and Business Loop Interstate 55 (6th Street). Toronto Road continues west directly to Woodside Road over the next 1.5 miles. Woodside Road connects with Illinois 4 and the first U.S. 66 alignment south to Chatham. Photo taken 12/20/09. Illinois 123 curves southeast through a diamond interchange (Exit 109) with Interstate 55 in the village of Williamsville. Photo taken 05/06/18. Williamsville lies midway between Springfield and Lincoln along Interstate 55. IL 123 ends just east of I-55 at Historic U.S. 66. Photo taken 05/06/18. "INTERSTATES CELEBRATE 40 YEARS // FAST TRACK FOR AMERICA OR LOSS OF AMERICANA?" Pantagraph, The (Bloomington, IL), June 23, 1996. "Veterans revamp finished - Center Street bridge also completed." Pantagraph, The (Bloomington, IL), October 4, 2004.